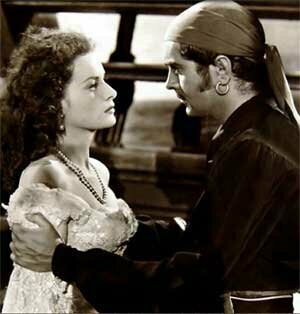 It is almost impossible to see a pPirate movie without seeing ear rings. Naturally the question has often arisen, did real pirates wear ear rings? Surprisingly, the answer is yes. from the movie The Black Swan. While I'm sure Hollywood was trying to make leading men such as Erroll Flynn and Douglas Fairbanks look suave and exotic , real pirates were piercing their ears for a more practical purpose. It was believed that piercing the ears with such precious metals as silver and gold, improved one's eye sight. This was the main reason pirates performed such a ritual. It must also be noted that most other sea faring men also indulged in the practice. While for years this was considered an old wives tale, today the art of acupuncture lends some credence to the practice of ear piercing. The ear lobe is an acupuncture point for several eye ailments. It is quite possible that the practice of ear piercing was brought to the west from the oriental trade routes. Still another source says they used the earring as payment when they crossed over to the next world (when they died). Now this sounds logical considering the superstitious nature of mariners but it has one problem. A fellow pirate was quick to pull your payment from your earlobe rather than send a perfectly good ear ring with you to Davy Jones. "As you are aware, sailors are supersticious and religious in their own way, and they carried gold from their ear so that if their body is washed ashore, they might buy a proper Christian burial. Because of this association between the earing and drowning, it soon became a good luck charm protecting the wearer from drowning. Later, an earring in the other ear became a charm to protect the wearer against fire (which was the other great danger sailors faced)." And as always it may have simply been a "fashion statement" on the wearers part. As pointed out by many people, pirates (at least the successful ones) were a colorful lot.